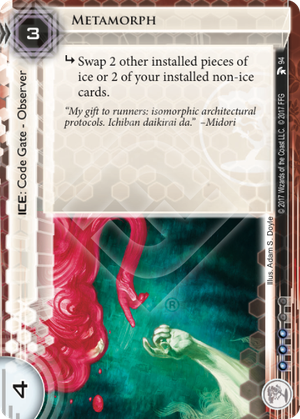 subroutine Swap 2 other installed pieces of ice or 2 of your installed non-ice cards. Can the Corp use Metamorph to swap a card with an installation restriction like Bamboo Dome (install only in the root of R&D) to a different server? Yes. These restriction apply at the time they are installed and do not affect the card once installed. Can the Corp use Metamorph to swap an extra region, asset, or agenda into a server? No. The Corp must still follow any applicable restrictions from card abilities and game rules. So people have been complaining about Metamorph being broken already. The theory is that you install an upgrade in HQ, install Off the Grid somewhere and have Metamorph fire. Presto, you can't run on HQ without successfully running on HQ and any extra Off the Grid locks out another server as well. This works great, until Off the Grid rotates out and provided you can get Metamorph to fire. Now since Metamorph is strength 4 ice most runners with a decoder will be able to break it. The main reason a runner will not be able to break it is that they don't have a decoder or AI installed and are going to run anyway. Like with all plays involving opponent mistakes: don't bet on it working. In order to make this trick work you need to both have Metamorph installed early enough for the runner to not have a decoder out, meaning you need to pack 3 copies, have Off the Grid installed early enough before the runner has a decoder out, 3 copies again and have some upgrade installed early. Since both Metamorph and Off the Grid are 3 influence cards you need to spend at least 9 influence regardless of whether you play this combo in Jinteki or Weyland. That's more than half your influence even if you have a 17 influence ID and that's as high as influence goes on Jinteki and Weyland ID's. Realistically you're spending 9 out of 15 influence. Even worse is the fact that you need a runner who will run with no ability to break 4 strength code gates when you have at least 3 credits. That's a runner who has never heard of Executive Functioning, Aiki, Yagura, Bloom. And that's assuming the chosen server has unrezzed piece of ice. With two pieces the runner also has to fear Chum and TL;DR.
Sure, it's possible a runner would go for it, especially if you're Weyland and put a nice juicy public agenda in a remote. But more likely the runner will be cautious. And the more credits you have the more cautious the runner will be. Oh and then you need to get Off the Grid (6) rezzed in time before the runner runs on HQ. Which is harder than it sounds since you need to have a low credit count before the runner runs Metamorph in order to convince the runner that's safe. That's a lot of pieces to pull off to have Metamorph fire. And that's why I don't think the Off the Grid combo can be pulled off reliably. If it's somehow possible to pull it off reliably runners will quickly learn to spot the distinctive pattern of an unrezzed card in a remote plus an upgrade in HQ and simply not run in such cases. But if you can't pull it off reliably you'll have invested so many influence in it that your deck will be weaker for it. And even without the 9 influence investment the problem with making the runner actually run on Metamorph is why it's a weak card when you use it for the effect of the sub. But there's another approach. Metamorph can be used as a taxing piece of ice. If the runner has reason to fear the effect this is 1 sub 4 strength must-break ice for 3 rez cost. However there is competition. Mind Game for example has the same subs and strength, no rez cost and a 2/3 chance (assuming both players have at least 2) to bounce the runner off the intended server and depending on the ice in the new server do some damage as well. Inazuma in front of a nasty or unrezzed piece of ice counts as at least 1 sub 5 strength ice (one of the subs could be left unbroken). So how does Metamorph hold up to the competition? Looking solely at code gates that don't require influence in Jinteki I'd say it's difficult. Metamorph is reasonably taxing if the runner has to fear it but you need to make the runner fear its effect and I think that will be non-trivial in practice. A card like Inazuma or Chum, though positional, may be easier to use. Metamorph is one of those cards that seems like it opens really cool combos but when looked at in the cold light of day is kind of underwhelming. I wish to report from experience on the combo with Off the Grid. Three games isn't a lot, but its enough in this case (not including the one where in the initial shuffle I had no ice and Mulligan I saw 1 ice and never saw a third or a Batty or an off the grid) to make a judgement. All three times I was able to get things set up enough that I could start to set up the trap. In one case I was able to pull the trap off... that one time was against a player who was only a few weeks of play in to the game and even then I couldn't get them for R&D. Without a reliable ETR or a Susanoo-no-Mikoto you can move Off the Grid and still lose the Off the Grid during the run. And you have to have an upgrade on HQ. That means you have a minimum of 5 parts just to have a chance to set it up. It's a fun trick, but it's not really something to fear.